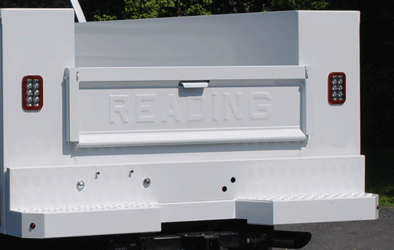 Reading’s Classic II™ aluminum service body combines the superior fuel economy and corrosion resistance of aluminum with Reading’s legendary quality and durability. 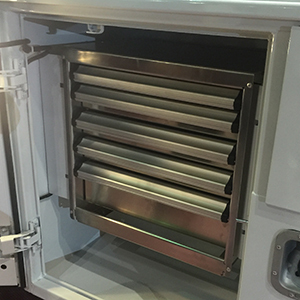 Our aluminum service bodies are built with premium recycled aluminum alloy, the body is bathed in a zinc phosphate bath to prep it for improved adhesion of Reading’s durable powder coat finish, to resist corrosion better than any other service truck body on the market. 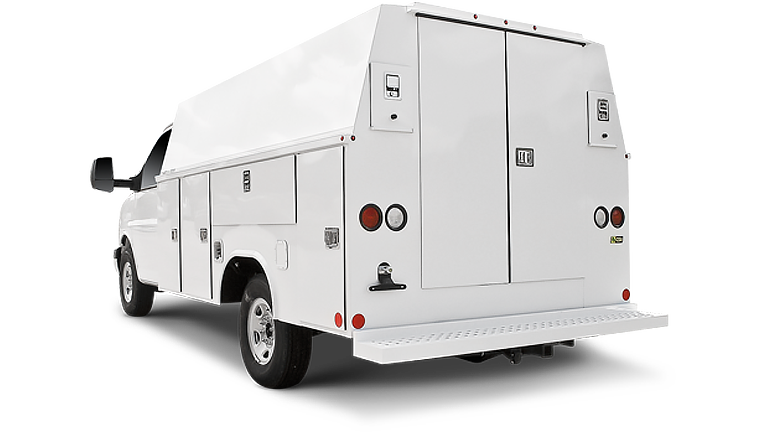 The Aluminum Classic II features all the standard and exclusive options that have made our flagship Classic II™ a leader in the truck body industry while offering environmental benefits that today’s consumers appreciate. 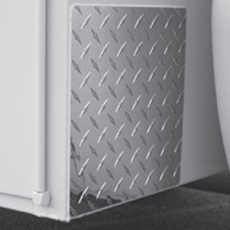 Standard features of our aluminum service bodies include a pressed diamond plate floor and inner tailgate surface, heavy-duty compartment doors and a rugged undercoated understructure for superior durability and strength. 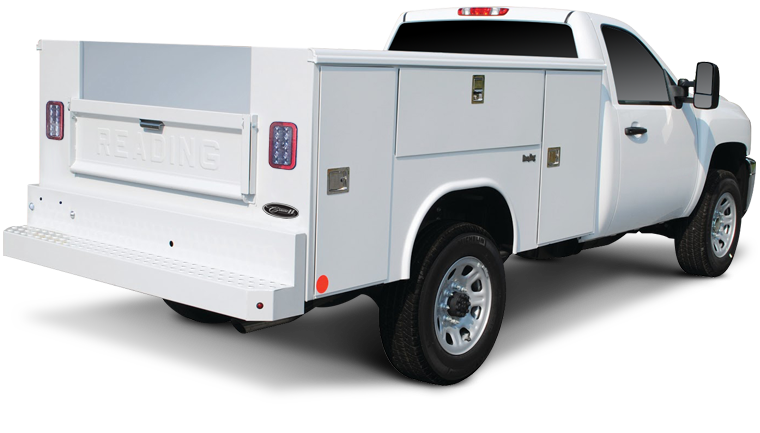 The Classic II™ aluminum service truck body also features Reading’s exclusive adjustable hidden hinges, Dual-Pro® door seals, a slam-action tailgate and much more. 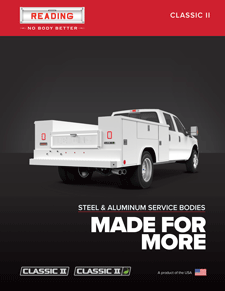 Add our industry-leading 10-year limited warranty to all aluminum service bodies and it’s easy to see why there’s No Body Better than the Aluminum Classic II™. 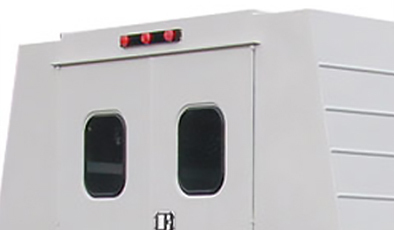 The heavy-gauge, all-aluminum compartment doors on our service bodies offer the lightweight durability of aluminum, meaning you get the reliability you expect from steel doors without the decreased fuel efficiency. 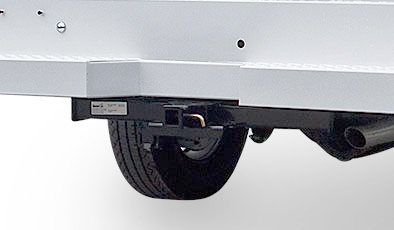 Our steel and aluminum service bodies feature frame-mounted bumpers with anti-slip surface to increase stability and safety while getting on and off of it. Includes LED marker lights. Pickup style slam-action tailgate with polished stainless steel handle and double-panel construction. Features stainless steel knee braces, locking rods, hinge rods and striker channels. 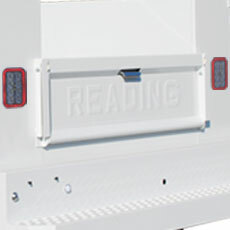 Knee braces are removable and protect against rust and corrosion while allowing the tailgate to swing down completely. Standard on both steel and aluminum service bodies. Heavy-gauge aluminum crossmembers and longitudinal rails help to protect against long-term wear and corrosion while helping to keep the service body at a lower weight. 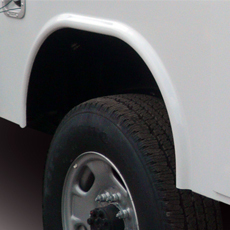 Standard on aluminum service bodies and vans. 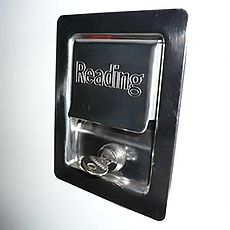 Patented hidden hinges are a Reading exclusive and resist forcible entry. 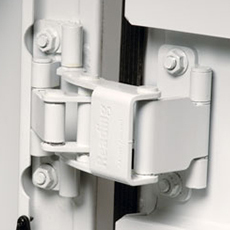 This robust and concealed hinge design provides protection against corrosion without requiring frequent lubrication or maintenance. 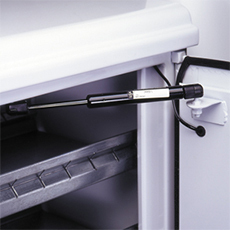 They are fully adjustable and easy to replace without special tools. 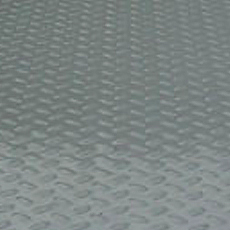 1/8" aluminum diamond plate floor. 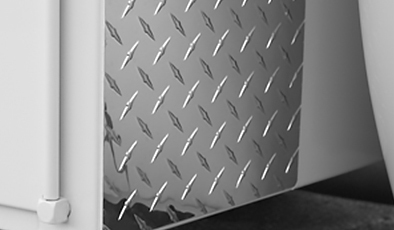 The aluminum diamond plate floor on our service bodies provides excellent durability without adding weight and reducing the vehicle's fuel efficiency. 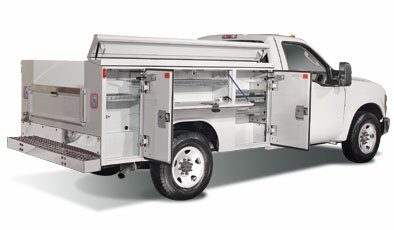 All vertical compartment doors are equipped with nitrogen strut door holders. 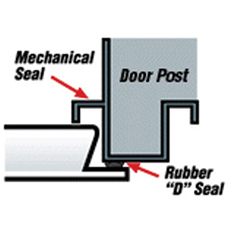 Internal dampeners control the opening and closing of doors ensuring the doors don't slam shut and damage the service body. The rectangular tail lights featured on our steel and aluminum service bodies provide a modern look, create clear visibility on the road and offer leak resistance. 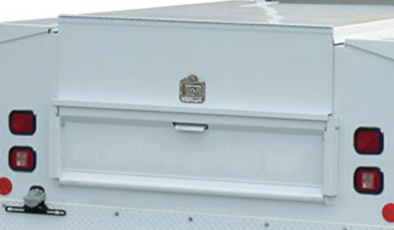 Braces allow the tailgate to swing down completely. Standard on both steel and aluminum service bodies. 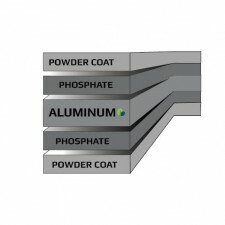 All of our aluminum service bodies feature a heavy duty aluminum, zinc phosphate bath for improved adhesion of our heavy-duty powder coat finish for the most durable, corrosion-resistant finish available anywhere. Keeping all of your tools, equipment, and other items safely stowed away should be a top priority. But getting to your needed possessions can be tedious when each compartment remains individually locked. The Latch-Matic® Locking System simplifies the entire process by allowing you to lock or unlock all doors within a 25-foot radius. Available for both the Aluminum Classic II and Steel Classic II service bodies. 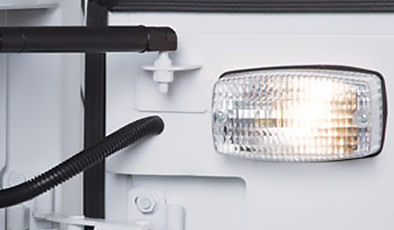 You'll ensure the clear visibility of your service body with our collection of LED stop/tail/turn/reverse lights, as well as cargo and compartment LED lights activated by Latch-Matic®. Available for both the Aluminum Classic II and Steel Classic II service bodies. Our aluminum and steel Classic II models can both be equipped with Ergo Glide-n-Lock drawers, which make up a modular compartment system that improves ease of access to your stored tools. 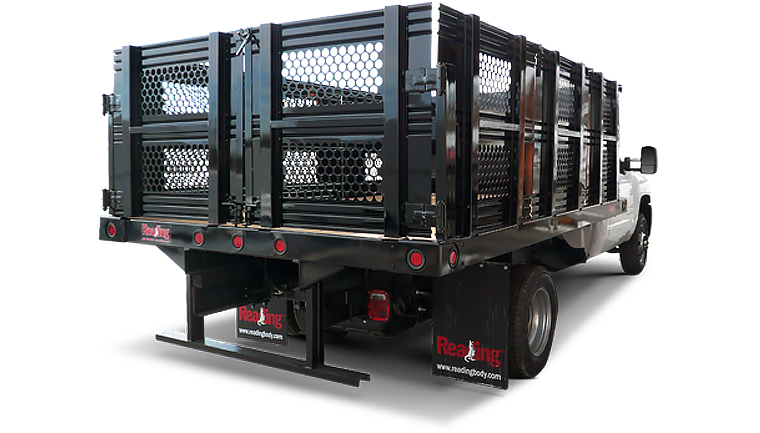 To reduce the likelihood of damage to the service body, you can install protective aluminum treadplate guards as well as tailgate guards. You can add both guards to the Aluminum Classic II and the Steel Classic II. 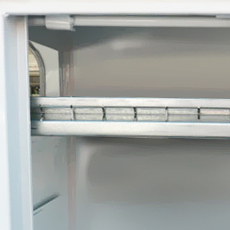 Aluminum chock block holders with chains to secure chock blocks. Can be ordered as single or dual per body side. Protects the service body from nicks and scratches from repeated insertion and removal of chock blocks. Available for both the Aluminum Classic II and Steel Classic II. 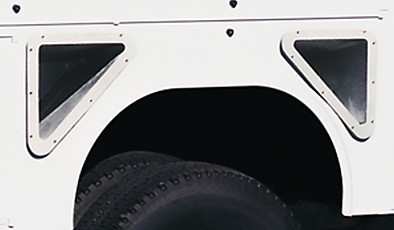 Bright finish aluminum treadplate splash guards are installed on the front of body panels and on top of the tailgate to produce an appealing, modern look and protect against regular wear and tear from road travel and loading. Available on the Aluminum Classic II and the Steel Classic II. Ensure that you'll be able to see your stored equipment and tools at any time of day with compartment lighting, which is automatically activated with Latch-Matic® keyless remote controller. These lights are programmed to go off automatically after 10 minutes or when the doors are locked, which helps to maximize the bulb's lifespan. 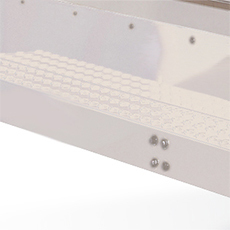 The lights feature impact-resistant Lexan lenses. One touch simultaneously locks or unlocks all compartments on the service body from up to 25 feet away, eliminating the tediousness of having to open each door to get to what you need. 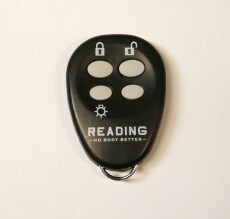 Two high-quality key fob transmitters are provided. 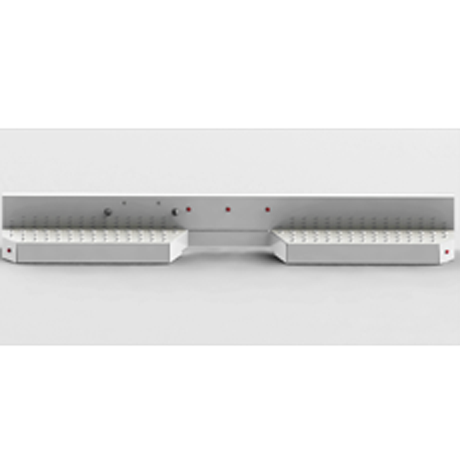 The systems consist of proven, automotive-quality components with concealed wiring and hardware. 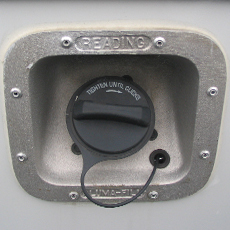 Compartment doors can still be locked individually with keys. Rubber-isolated LED lights include clearance, stop, tail and turn lights for complete illumination in every situation. These ultrabright lights create distinctive signals that meet all necessary safety regulations, as your service body will be easily visible in every environment. 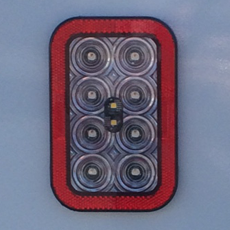 LED lights are standard on all service bodies. Rugged steel construction helps to maintain a robust and durable grip on all of your pipes regardless of size, design or material. 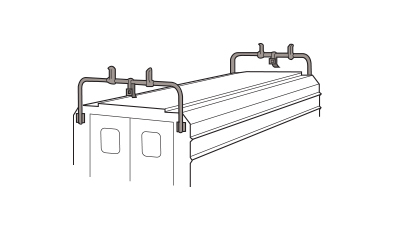 The rack holds pipe sections securely in place, allowing you to maximize the available space on your service body. Available on both the Aluminum Classic II and the Steel Classic II. 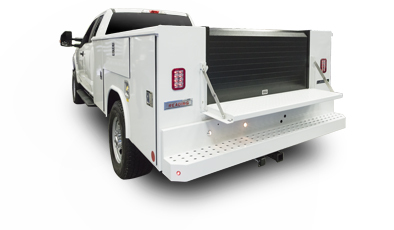 The frame-mounted recessed bumper creates an additional degree of sturdiness when loading and unloading, and the pooched anti-slip surface helps increase the safety of the service body by adding more steady space to work on. 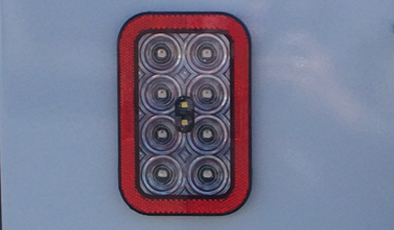 The bumpers have LED lights included to maintain high levels of visibility. 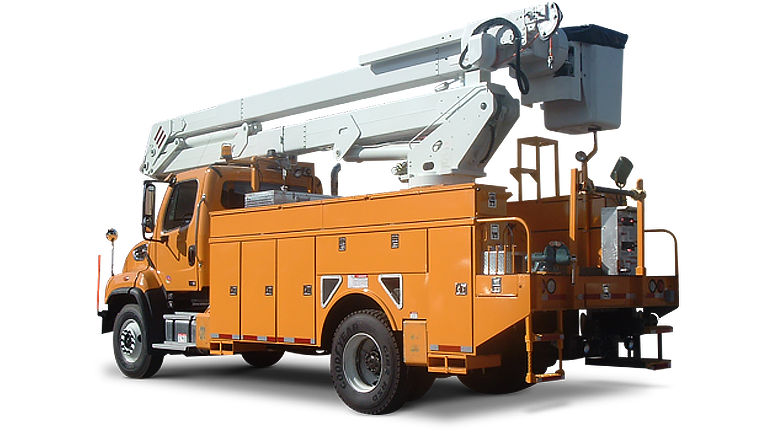 As an efficient way to maximize the available space on your unit, removable ladder racks allow you to store ladders securely out of the way on the top of your service body. You can remove the rack when it's not in use. 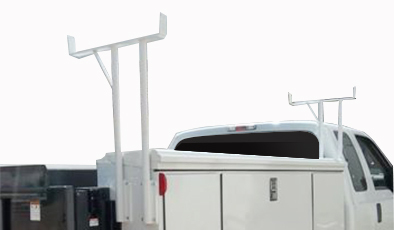 Offering a different orientation for people who want the increased functionality of a ladder rack without the particular placement of an overhead mount, the removable side-mount ladder rack is available in angular and flat rack designs for both the Aluminum Classic II and Steel Classic II service bodies. You can remove this mount when not in use. 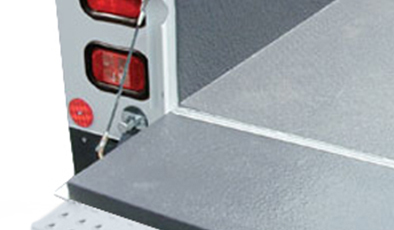 If you need a secure storage option for ladders you bring along on the job, our side-mount rack consists of heavy-gauge steel that's bolted to the panel top, giving you a permanent way to create more space on your service body. 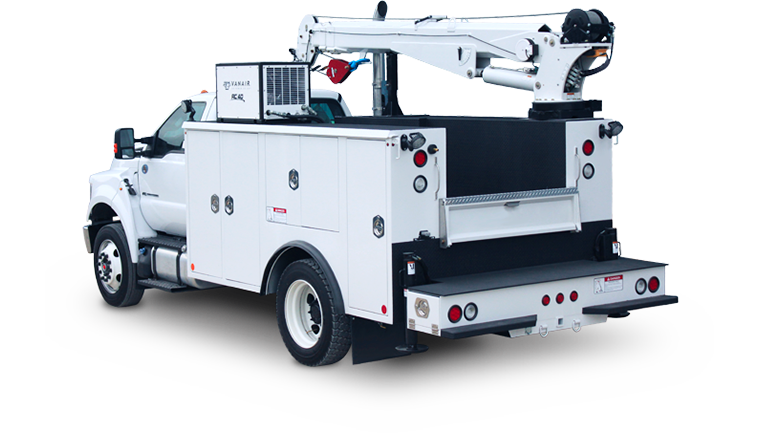 Keeps ladders locked securely to the side of your service body. 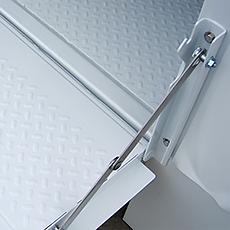 Sliding tops provide excellent security for tools and supplies stored in our service body load space, as well as an added degree of convenience. The rear section slides freely on full-length aluminum tracks. The front section is stationary. They include locks with a two-point positive action T-handle lock. Available in heights of 48" and 57". 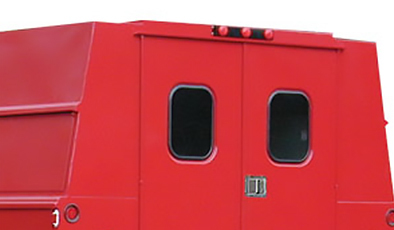 Enclosed work area, plus four lift-up doors. 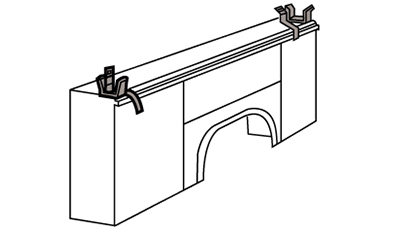 Upper roadside compartments permit direct access from the interior. 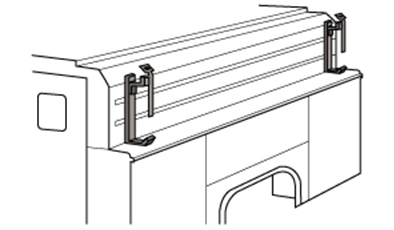 Upper exterior doors are held in place by pneumatic struts and feature T-handle locks. 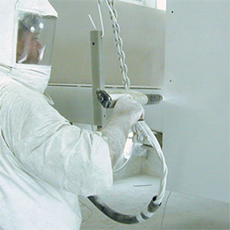 Protected by acrylic E-Coat priming and durable powder coat finish. Available for both the Aluminum Classic II and Steel Classic II service bodies. If you need increased functionality and maximized available space, the spacemaker top provides additional storage space for tools on the top of your service body. Available for both the Aluminum Classic II and Steel Classic II. Available as a factory-installed option. 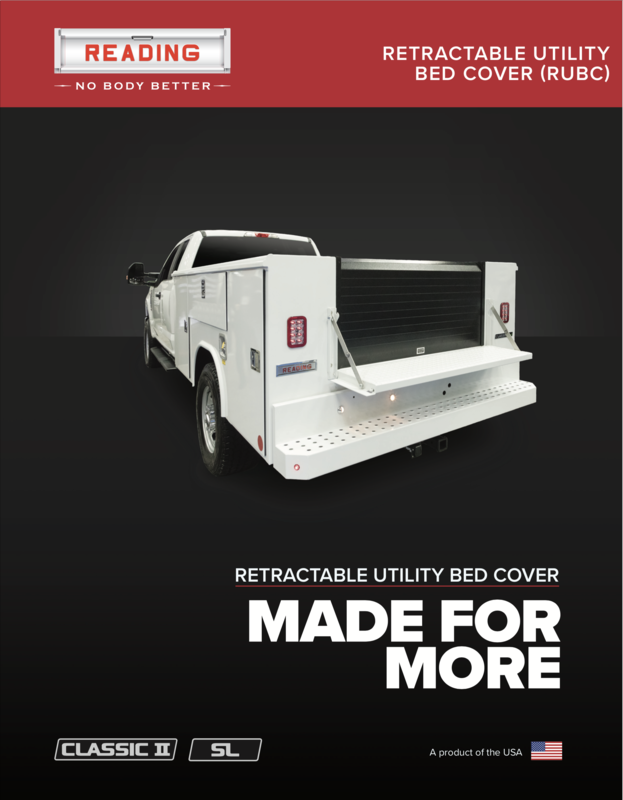 The liner provides durable, watertight and airtight truck bed protection. Prohibits rust, corrosion and surface abrasion while providing a slip-resistant surface for walking around on without fear of losing your footing. Available for both the Aluminum Classic II and Steel Classic II service bodies. Available in heights of 50", 60" and 72" for most service body models. 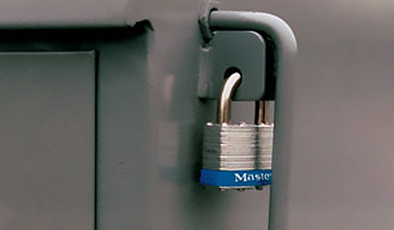 Rear doors close and lock securely with stainless steel rotary locks. Panel top completely E-coated and powder coat finished for increased durability. 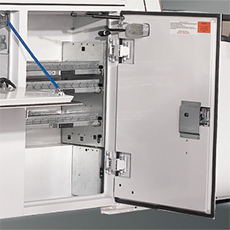 If you want to store some of your larger equipment without leaving it exposed to weather and other potential threats, you can open and access this compartment from both rear vertical and horizontal positions for storage of longer tools and materials. Available on most service bodies. 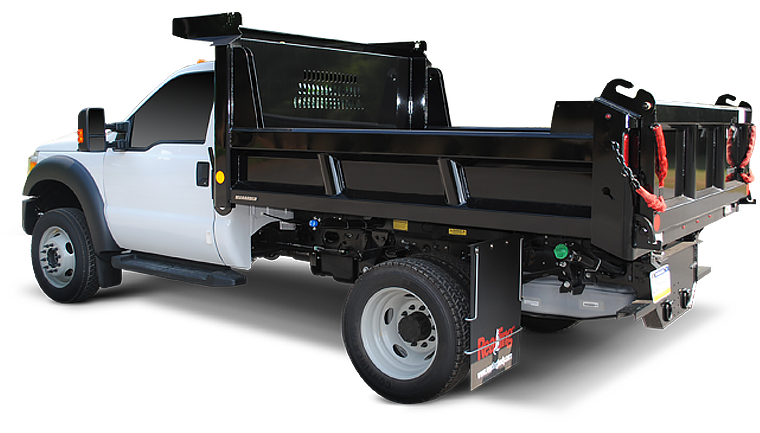 If you need to bring along a trailer for your next project, you can select a heavy-duty tow hitch, which is available to provide towing capabilities to all service bodies. 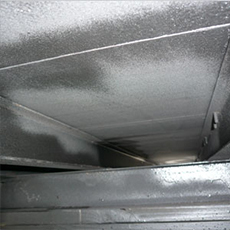 The RUBC is designed for service bodies to shield previously exposed materials from the weather and potential theft. It's available as a manual spring-action cover or with an electric motor operated by a manual switch and optional with a hands-free remote (sold separately).